Montessori Preschool is an award-winning network of boutique, teacher-owned preschools, serving children ages 6 weeks to 6 years. Our schools have been named one of the top three in Houston and one of the best in Texas. We are small-scale, family-owned, and operated by a Montessori teacher. We believe children have unlimited potential. Children deserve an early education with a global outlook in order to prepare for school and life. A true Montessori education develops a child’s inner powers, self-discipline, and concentration, leading to lifelong learning. In our school, learning is social and active. Children organize fun events to celebrate holidays and festivals. Children collaborate with each other or work independently, developing critical social skills for elementary school and life. The schools are owned-and-operated by an Association Montessori Internationale (AMI) Montessori teacher. AMI was founded in 1929 by Dr. Maria Montessori to maintain the integrity of her life’s work. Montessori teachers are in leadership roles – so learning (not profit) is always first. We believe children have unlimited potential – and there’s no better time to educate children than in the early years. Through the Montessori Method, our children not only learn to read, write, and do math and science, but also, more importantly, they learn to socialize, be independent, and concentrate. Our alumni and their experiences are the best reflection of our school. In the 21st century, children will interact with people from across the globe. We use current events, cultural festivals, and our International Doll of the Month speaker series to spark conversations on culture and geography, and we celebrate the diverse heritage of our community. Our teacher-student ratios are intentionally low to maximize personalized instruction and improve learning outcomes. Our campuses have a large playground, with shady trees, for children to learn and play outdoors. We also have covered outdoor spaces for picnics and story time. Our spacious, sun-filled classrooms have attached bathrooms, so children can safely remain in the classrooms. Science, Technology, Engineering, and Math (STEM) education is integrated in our classes everyday. STEM is a part of your child’s all-day routine – not just part of a specialized curriculum or a separate room. We are not a corporate-owned school. Our schools were started in the early 90’s by a family of educators in Houston, Texas. We believe in the effectiveness of small, local family-run schools and personal service. Learning is best when families are involved, and we build lifelong relationships with our parents. Through our Parent Ambassador and Mama Bear programs, parents actively contribute to school activities and events and play leadership roles on our campuses. Our students do well in elementary school and beyond. Our students typically transition into Gifted and Talented programs and others skip grades. Many exceed state standards in reading and math. Several alumni also successfully compete to earn admission to private schools across Houston and around the world. Montessori Preschool serves children ages 6 weeks to 6 years. We have Montessori and extended care programs with part-time and full-time options. The Nido // Infant program is designed to meet the developmental needs of infants ages 6 weeks to 17 months. Dr. Maria Montessori first described the infant environment as Nido (meaning Nest in Italian). The classroom environment is cozy, loving, secure, attentive and comforting – just like at home. 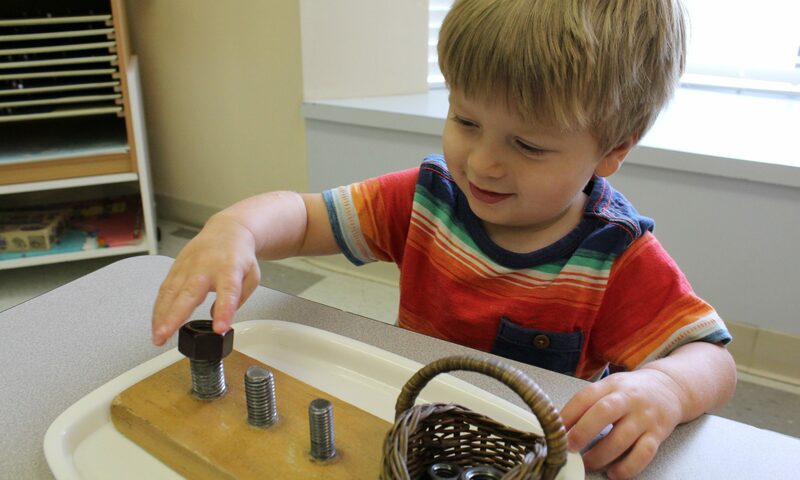 In the Montessori environment, Toddlers learn to be independent and confident, while developing their fine motor skills, oral language abilities, and concentration. If they’re ready for the challenge, Toddlers begin to master introductory phonics, numbers, and science concepts in preparation for the Children’s House (ages 2 ½ – 6). The Children’s House community references the world’s first Montessori Preschool, called the Casa dei Bambini (meaning House of Children in Italian). In the Montessori environment, each child’s rhythm of growth is respected, while developing order, concentration, motor coordination, and independence. The Montessori Kindergarten Program is the final year of academic preparation at Montessori Preschool and rigorously prepares students in reading, writing, math, science, and the social sciences for Grade 1. They learn to be leaders in the classroom and in the larger school community. Children lead special initiatives in school and practice their academic skills through special events and experiences, curated for them and their families. In the 21st century, children will interact with people from across the globe. Our programs and pedagogical practice help young children develop a global outlook by investigating the world, weighing different perspectives, communicating ideas effectively, taking action with an entrepreneurial spirit, and applying an interdisciplinary lens to their views of the world. Local parents have donated over 120 dolls to our schools to represent their child’s country of origin in our community. We highlight an International Doll of the Month to spark conversations on geography and culture in class and in our wider school community. When children leave our school, they join our rigorous Leadership for Kids experience, where they tackle global challenges and learn to lead in an intercultural world. Drop by our schools and see Montessori education in action. Tours are available by appointment only, given our desire to provide our families with individual attention and an increasingly high demand for visits. We encourage families to visit in the mornings in order to see children engage in the Montessori environment. Please let us know if you would like to speak with a current parent or alum.